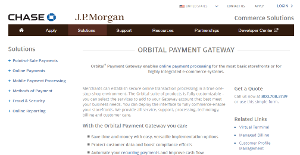 What is Orbital Payment Gateway? Orbital Payment Gateway gives business a full suite of customizable features and capabilities to help them address their business needs and requirements. The service also comes with a commerce-optimized interface that can be deployed right from the get go. On top of that, Orbital Payment Gateway provides their clients with top class support and technology. Orbital Payment Gateway brings a number of benefits for the most basic storefronts or business with highly integrated e-commerce platforms. This payment processing suite is loaded with the basic features and tools one would expect from a major payment gateway, such as hosted payment pages, a virtual terminal, billing management, customer profile management, an account updater, flexible integrations, and fraud prevention. Chase Paymentech securely hosts Orbital Payment Gateway’s payment page, offering businesses and their customers a potent combination of a simple checkout and tight security. All pages can be tailored to match the look and theme of your website to give you that seamless brand matching. All information entered by customers in the hosted page are stored in Orbital Payment’s servers. That means users don’t have to worry about receiving and storing data on their physical systems. With Orbital Payment, businesses can accept orders through phone or mail and store essential information credit card data on its virtual terminal. The information is processed through a very secured browser. With Orbital Payment’s virtual terminal, both businesses and their clients enjoy more payment options. Virtual terminals can be accessed anywhere, anytime, and from any device with internet connectivity. Orbital Payment Gateway is created in a way that it is easy to protect customer data while adhering strictly to compliance policies and regulations. As recurring payments are automated, users will definitely enjoy improved cash flows. If you are interested in Orbital Payment Gateway it may also be a good idea to investigate other subcategories of Best Payment Gateway listed in our base of B2B software reviews. Every business is different, and might need a particular type of Payment Gateway solution that will be fit for their business size, type of customers and staff and even specific industry they deal with. We advise you don't count on locating a perfect app that will be suitable for each business regardless of their background is. It may be a good idea to read a few Orbital Payment Gateway reviews first and even then you should remember what the software is supposed to do for your business and your employees. Do you need a simple and straightforward service with only essential features? Will you really use the complex tools required by experts and large enterprises? Are there any particular features that are especially practical for the industry you work in? If you ask yourself these questions it is going to be much easier to locate a reliable solution that will match your budget. How Much Does Orbital Payment Gateway Cost? We realize that when you make a decision to buy Payment Gateway it’s important not only to see how experts evaluate it in their reviews, but also to find out if the real people and companies that buy it are actually satisfied with the product. That’s why we’ve created our behavior-based Customer Satisfaction Algorithm™ that gathers customer reviews, comments and Orbital Payment Gateway reviews across a wide range of social media sites. The data is then presented in an easy to digest form showing how many people had positive and negative experience with Orbital Payment Gateway. With that information at hand you should be equipped to make an informed buying decision that you won’t regret. What are Orbital Payment Gateway pricing details? What integrations are available for Orbital Payment Gateway?